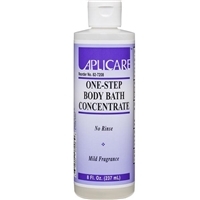 Westcoastmedicalsupply.com is your online source for quality medical hygiene and skin care products. Choose from the Medline Remedy line of creams and lotions to the No Rinse wipes and shampoo caps all at everyday low prices. Medline ReadyBath Bathing Wipes and Shampoo Caps - ReadyBath bathing solutions from Medline requires no water and no rinsing to be clean. ReadyBath wipes and shampoo caps are an ideal option for people who can't shower. ReadyBath is used in hospitals. No Rinse wipes and No Rinse shampoo caps at low prices. We feature No Rinse wipes and No Rinse shampoo caps. No Rinse wipes and shampoo caps are easy to use, convenient and cost effective. No Rinse bathing wipes and shampoo caps don't require any water. No Rinse products by Clean Life. SUNzyme is a water based odor neutralizer consisting of a blend of natural oils which have been formulated and distilled. Sunzyme is a unscented odor eliminator from Clean Life products. Our Sunzyme Odor Neutralizer is available in 2 oz and 8 oz bottles. 02300, 02310.